It all happens quickly. You shoot out an @reply on a whim, just like you usually do. Then suddenly, you're getting more favorites and replies than ever before. "Hm, that's weird," you innocently think. You begin scrolling through the list of 30+ users who have retweeted you. You see one person whom you follow. You read the handle, stop, blink, read again. 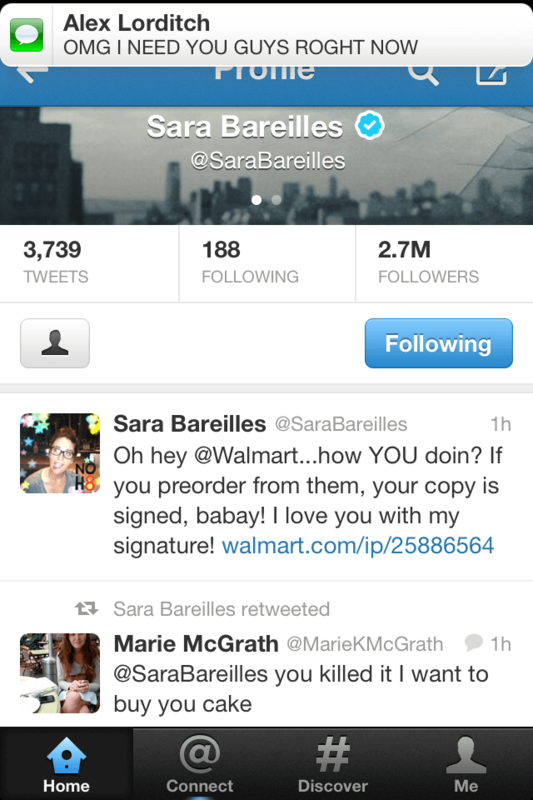 Yes, it's true: retweeted by @SaraBareilles. For most of you, Miss Bareilles might not be the ultimate celebrity with whom to have a twitter interaction. But for me, this is bigger than @Beyonce, bigger than @taylorswift13 and maybe even bigger than @BarackObama. If you are like I am, heart palpitations commence. You take a series of frantic screenshots of the tweet, lest it spontaneously disappear and take all proof with it. Friends who are aware of your obsession text you in all caps using exclamation points and question marks, inquiring about your state of mind (as you can see from my screenshots). Your mom calls you. The temperature of your face warrants medical attention. You think to yourself: "how do I react? Do I try and continue the conversation?" Now you know that this celeb might actually read what you say, you try to think of something that seems cool and make a mental note to keep psychotic fangirl tweets to a minimum in the future. You tweet your carefully crafted witty response and hope for another miracle. You read through all those people who replied to your tweet and smile to yourself at their transparent attempts to be funnier than you were to get this celebrity's attention. You know because you have been that person, but not this time. You came out on top. Your tweet, immortalized forever on their profile. Why is this such a thrill? I suppose it's just like getting a response to a very short piece of fan mail. Imagine yourself in my shoes: your all time favorite, seemingly unreachable celebrity whom you admire and adore, acknowledges you on the internet. This means a few things: he/she saw your name and read it. They know you exist. And what's more, if they retweeted you, THEY APPROVE OF YOU. You are affirmed as someone who made them laugh or said something they liked enough to share with their MILLIONS of followers. You have been invited, for 140 characters, into the life of a famous person. And it feels great.